Naples, Italy is famous for many things – but not everyone knows that chocolate is one of them, nor that the city’s champion chocolatier is Gay-Odin. I first heard the name in an Italian class at the Centro Italiano followed by the words “… molto famoso “. That was last summer. Since then I’ve noticed the name on a couple of chocolate shops, particularly two small, dark-fronted stores on the Via Toledo, but I’ve never been in. They’ve always looked a little exclusive. A week ago everything changed. We were in the Chiaia part of town on the hunt for pastries. We spotted what we thought was an ordinary cafe with large glass windows and gleaming counters. In we stepped. What met us was chocolate – raw; gleaming; decorated; packaged; and ice-creamed. 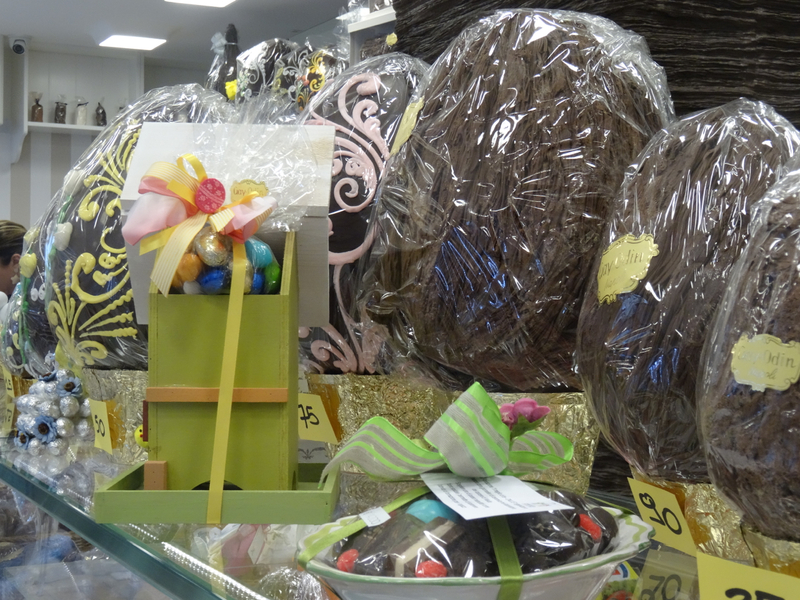 There were a few pastries but they hardly got a crumb in edgeways – it was the parade of handmade Easter eggs that stole the show. 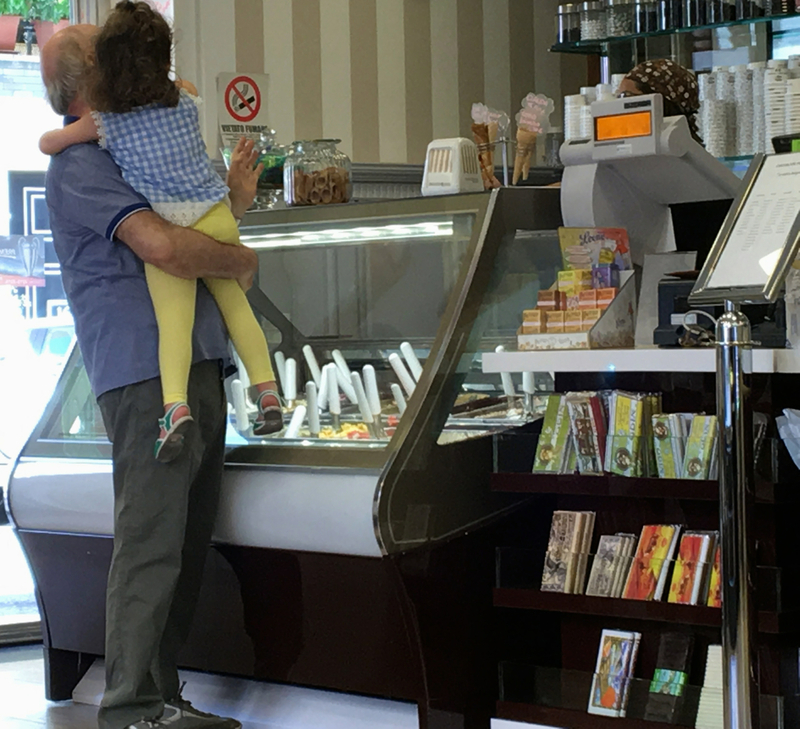 It turned out we’d stepped into Cioccolato Foresta – Gay-Odin’s latest outlet in Naples and a complete change from the intense, dark interiors of the original stores. 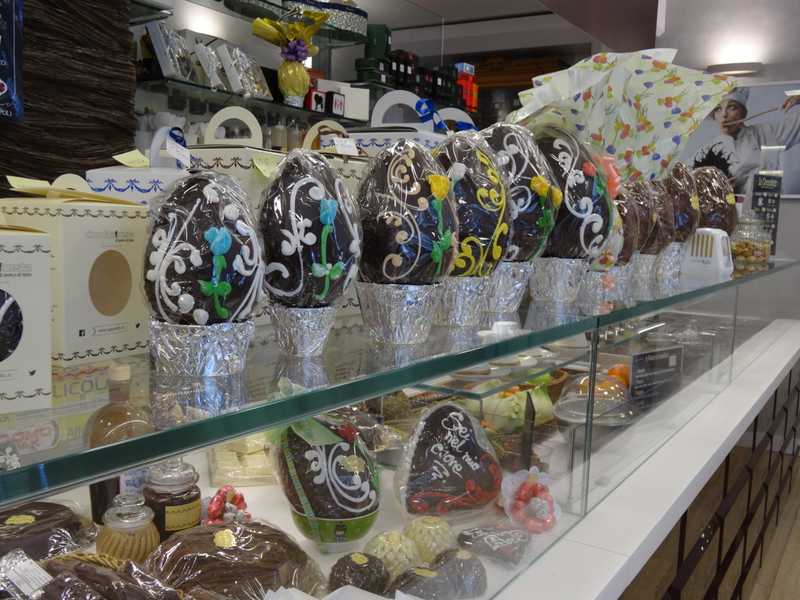 Cioccolato Foresta has been open a year. Everything glistens – it beams calories and happiness. We tried a little Italian, took a few photographs, and had a taste. The mouthful was everything it promised it would be – flaky soft, and cushioned with air. Why so good? Because Gay-Odin is not just any old chocolate maker. 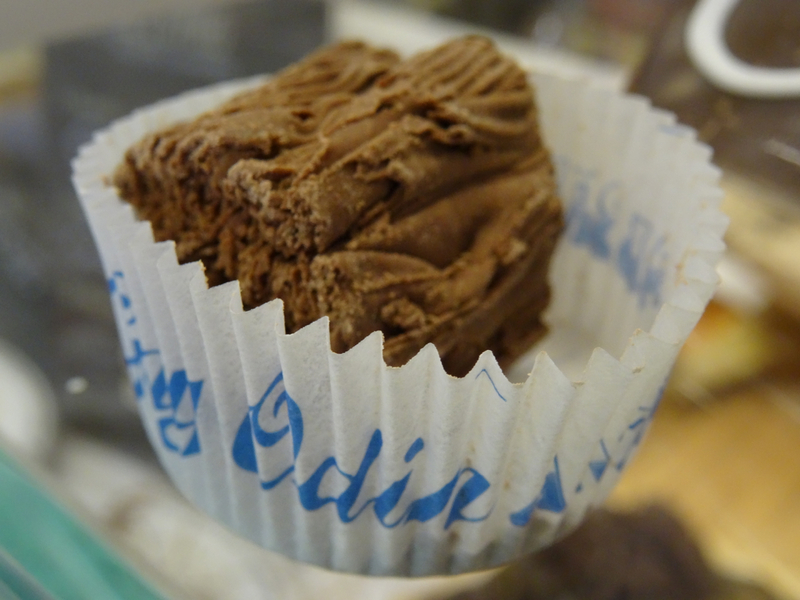 A little over a century ago Isidoro Odin, chocolatier, arrived in Naples from Alba, Piedmont, which is in the north of Italy close to Switzerland. He set himself up in a fashionable part of Naples and started to make his chocolate. By 1922 he had opened his first shop and others followed. He and his wife, Onorina Gay, had no children to pass their business to but its name has never changed and its chocolate is still the best known in Naples. The Castaldi-Maglietta family now own Gay-Odin, and the cafe we’d stepped into – light-filled and very, very hard to resist – is the company’s newest addition in Naples. 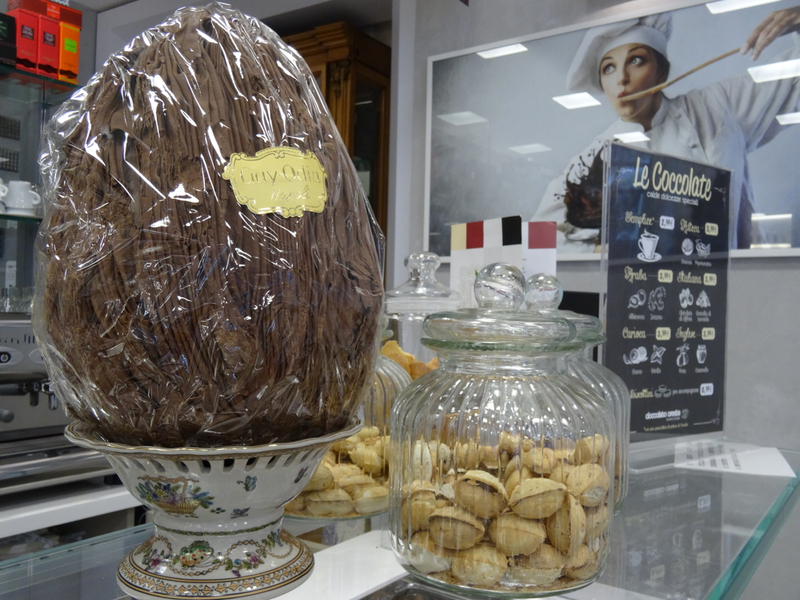 Here’s where we were tempted: the one-year-old Cioccolato Foresta, Via Carducci 29, Napoli. Gay-Odin is also in Rome and Milan. 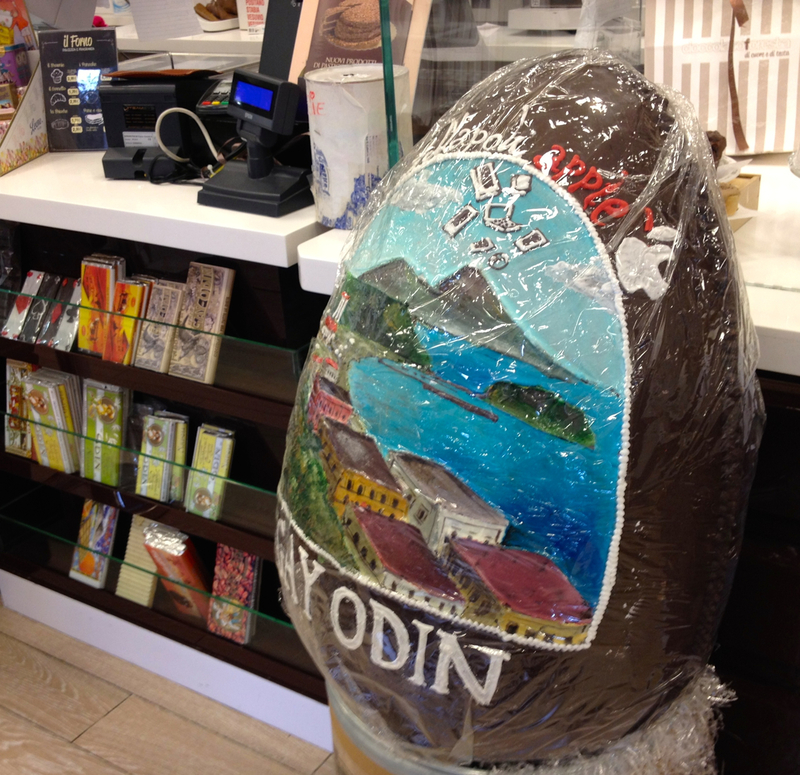 This entry was posted in Italy, Naples, Other discoveries in Naples and tagged Cioccolato Foresta, Easter eggs, Gay-Odin, Isidoro Odin, Maglietta family, Naples, Onorina Gay. Bookmark the permalink. A look back (first published 2 April 2015): I wrote this on impulse after we stumbled into this gleaming chocolate store. The staff were so friendly and the chocolate so delicious I could not resist. Happy Easter Lyn! Wonderful to hear from you … you’re right, these traditions are what make life individual and special. Thanks Annabel and Happy Easter to both of you under the wonderful Mongongo tree!